We have some pretty interesting stats from the first week of the Olympics. We purposely increased our incident response crews on the road to help keep traffic moving during the games and, surprisingly, we've responded to more than 700 incidents. We have helped clear disabled and abandoned vehicles, collisions and debris along our highways between Sea-Tac and Canada. Just yesterday, crews in Whatcom County responded quickly to a crash where a camping trailer had flipped and was blocking all southbound lanes of I-5 just south of Bellingham. A quick-thinking crew member, Fred Price, hooked a chain to the trailer and used his rig to turn the trailer in such a way so that drivers could get by using the shoulder. 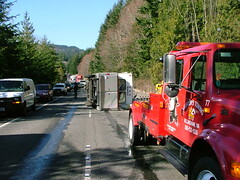 Our incident response crews then worked with the tow trucks to upright the trailer and get it out of the way of drivers. Traffic backed up several miles, but it could have been much worse had our incident response crews not been near by. Whenever possible we like to provide you with the most updated information. Unfortunately this can sometimes lead to a bit of information overload. We took a step back lately to assess what information we are sending out and how it is working and one of the areas that caught our eye is with how we report mountain pass conditions via email. When you go to a Web site to look for real-time information you expect it to be there. That’s why we update the pass report conditions for the major passes (Snoqualmie, Stevens, etc) whenever those weather conditions change. That way you know you are getting the latest information available. This type of reporting works well for a Web page, but we are finding it doesn’t work well for an email. We have been using our email system to report the same real time conditions for mountain passes but because these conditions can change so often we have found we are sending up to ten emails a day. This is where you come in. Do you want to continue receiving an email every time the weather conditions change on the mountain passes, or would you rather only be notified when the restrictions change (traction tires advised/required/chains required)? If we only reported on restrictions it would significantly cut down on the number of emails you receive in your inbox and would give you the most valuable information you need regarding the passes. Changing to restrictions only would also enable us to send you a text message instead of an email, because of the length of the pass report this isn’t currently available. What do you think? Why wait to assess the reopening for the North Cascades Highway until Feb. 22? The question comes up every time we have a mild “El Nino” winter in the Cascades, but the answer is the same. Sending our Avalanche and Maintenance crews to do a reopening assessment any earlier than late February/early March, wouldn’t work since there's still too much winter ahead. They need to be able to make any objective determinations about when to begin the reopening process. That is, setting a firm start date, figuring out how much and what kind of equipment will be needed (for example, we have to put the caterpillar work out for competitive bids) and get our internal crews and equipment lined up. North Central Region has a 3 man avalanche control team, Avalanche personnel are required to be on site while the crews are clearing the highway through the avalanche zones. Last year, for example, work on the North Cascades was delayed a couple of times when the Avalanche team had to go back to Stevens Pass in order to keep it open. The Kodiak snow blowers we use are from the three assigned to Stevens pass and can’t be released to NCH until they're not needed there. That means the clearing work usually begins with only one blower and more are “sent north” as they’re “available”. Our Avalanche forecasters have lots of historical data and "know snow" and have done a pretty good job over the years picking a start date that worked, but doing the assessment any earlier could be risky and really unnecessary. While we're always being urged to open the highway as soon as possible (preferably by the opening weekend of fishing season), we also hear from some winter recreation businesses that ask us not to open before Easter because when we do, it costs them business! Apparently, we’ll never please everyone. Please remember that on the North Cascades, we do not do “active” avalanche control like we do on Stevens and Snoqualmie. Washington (and also Chinook) pass are federally designated Scenic Highways that are closed during winter. We really can't knowingly put our crews or drivers at risk by opening a highway before it can really stay open. 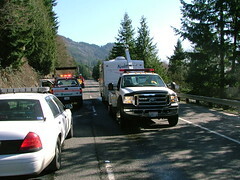 In 2005, we had the earliest SR 20 opening ever on March 10. By opening that early, and then having a huge storm hit, refilling avalanche chutes, closing the road again for 10 days, we had to bring back the crews, equipment, etc. and repeat much of the reopening work. That "extra" clearing effort might not be considered to have been the best use of our gas taxes. By the way, checking that last "El Nino" year for Stevens Pass one finds we had almost no avalanche control and low snow accumulations until March when we got hammered with almost 200" of snow. By way of comparison - there's less than 90 inches on the ground now and the total accumulation for this season, so far, is less than 250 inches. Last year’s season total was about average at 434 inches. Wildlife collisions are a worldwide problem and WSDOT is one of hundreds of agencies that have been trying for years to find effective and affordable ways to reduce them. A variety of solutions have been tried with varying degrees of success. Some are applicable in only specific areas or only work for certain species. Others didn’t work at all, cost too much, required too much maintenance, or created undesirable unintended consequences. Reducing speed limits would seem a simple solution and it’s been tried in many countries. Traffic engineers know that studies have documented that most drivers will drive as fast as the roadway will comfortably allow regardless of the posted speed. (That’s actually how speed limits are set – the speed that 85% of the drivers drive on a particular road, safely traversing it.) The engineers also find that when the speed limit is set artificially low, some drivers will indeed slow down, but most of them don’t. The result is a higher rate of rear-end and head-on collisions. At the same time, lower speeds also have not been shown to significantly reduce the number of wildlife/vehicle collisions. Near Rocky Reach Dam, just north of Wenatchee, we tried a laser beam system developed by Battelle NW Laboratories. It triggered beacons on signs alerting drivers that there were deer on the highway ahead. We found the lasers could only be used for short distances on straight sections of roadway. Anything that broke the beam triggered the beacons, including birds, dogs, mail trucks and snow plow curls. 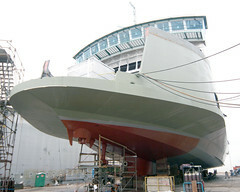 Perfect alignment was critical (high maintenance costs). Even the sun could trigger the beacons depending on the time of year as sunrise and sunset angles changed. Regular commuters soon learned to ignore the flashing beacons. The most successful solutions we’ve implemented have been in conjunction with fish passage projects where we’ve removed culverts and replaced them with much taller underpasses (bridges) to allow creation of a natural streambed for the fish and enough streambank for wildlife to cross under the highway, too. Examples: SR 20 in the Methow Valley, and Twisp, also under US 2 east of Stevens pass. Overpasses also work. The I-90 Snoqualmie Pass East project, now under construction, has plans to include natural land bridges over the freeway to accommodate wildlife migration patterns. The overpasses, however, are located outside of the currently funded five-mile portion of the project from Hyak to Keechelus Dam. We started construction on the Hyak to Keechelus Dam project last year, which does include wildlife underpasses such as bridges and box culverts. Wildlife fences have recently been showing amazing results in reducing vehicle wildlife collisions in Canada and elsewhere. (A typical installation puts fences on both sides of a highway and funnels animals to under or overcrossings to accommodate their migration patterns.) North of Wenatchee, WSDOT is installing a fence on US 97A between Rocky Reach Dam and Entiat to test whether it can provide an effective/affordable tool to reduce wildlife collisions here. While this isn’t the worst wildlife/vehicle collision location in Washington, it provides a test of fencing for control of valuable bighorn sheep in addition to deer. Just the design and construction phase of the first part of the project showed fencing costs were higher than for a “deer only” fence due to the modifications required because the bighorn are stronger, more nimble and smarter than mule deer. The entire project constructs a 9 mile long fence from Rocky Reach Dam to Spencer Canyon, two miles south of Entiat, where (’93 to ’03), there was an average of 30 wildlife/vehicle collisions per year. The goal of the project is to reduce those collisions by 50 to 80%. The first 4 -1/2 mile “upper” section was started last July and completed in December (2009). The second 4-1/2 mile “lower” section is scheduled for construction next year (2011). While we do not expect to see 50% of the benefit of the whole fence from the half that is completed, we do expect a significant reduction in vehicle/wildlife collisions for the next year. This year also provides time for a 4-season study of the wildlife interaction with the new fencing, its one-way gates and the effectiveness of the cattle guards at the road/driveway accesses. The study will guide our design engineers in making changes that can be incorporated into stage 2 to make that installation even more effective. While it’s too early to have any statistically valid data, our maintenance crews, State Patrol troopers and Fish and Wildlife biologists say that they’re seeing fewer deer and sheep on the road, finding fewer carcasses and investigating fewer collisions through the corridor. Just a quick note to let you know that we have made a minor change to the way you provide comments. Recently, we have been hit with a barrage of spam comments causing us to spend far too much time sorting through them to make sure we haven't missed a legitimate comment. We have added a word verification step that we hope will enable us to have fewer spam comments. As always, we love hearing from you. Please let me know if this change adversely affects you in any way. The American Recovery and Reinvestment Act has been one of the most watched, most analyzed public investment programs in our nation's history. The level of accountability we have tried to maintain has been very high. You can see that in how we developed our Recovery Act web site. But we can become lost in counting the numbers and forget the reason why the Recovery investments are so important. We are recognizing the first anniversary of the Recovery Act by sharing a few of the stories of the people who were directly affected. We call it Faces of Recovery. The series was compiled from stories written throughout the past year from all across Washington. The Recovery Act has invested hundreds of millions of dollars in Washington transportation system. We think it has also made an investment in people's lives. On Monday, Feb. 15, workers will take an important step toward completing the new Royal Brougham Way bridge in Seattle’s SODO neighborhood. That morning crews will open the west end of the bridge for drivers to get into a new second floor entrance of the Qwest Event Center Garage. In terms of milestones, it’s a small one, because it only affects folks who park in the garage. But to me it’s a symbol that we’re getting closer to opening the bridge this spring. The bridge is part of WSDOT’s SR 519 Intermodal Access project, which also includes a new I-90/I-5 off-ramp to the Atlantic Street overpass, and a wider First Avenue S./S. Atlantic Street intersection. Crews completed the intersection work in spring 2009. The bridge and ramp will open this spring, before major construction begins to replace the southern mile of the Alaskan Way Viaduct between Holgate and King streets. This will help keep traffic moving during construction and into the future, and provide a safe, elevated crossing over the railroad tracks west of Fourth Avenue S.
What the heck is intermodal, anyway? Describing the project to the unfamiliar is sometimes difficult and a big stumbling block is the project name – the SR 519 Intermodal Access project. It’s a mouthful, and not terribly descriptive of the project and it’s benefits. The first problem is the highway name. Ask people where SR 519 is and you’ll probably get a blank stare. To clarify, SR 519 is the east-west corridor (Royal Brougham Way and S. Atlantic Street) that connects I-90 and I-5 to the Port of Seattle, the stadiums and the waterfront. Inter is a prefix meaning between. Modal refers to types of transportation. Access is a means of entry or approach. I suppose the project provides a means of entry or approach between multiple kinds of transportation. No wait, that doesn’t work either. If a picture says a thousand words, how many words does a slide show say? Then I had a better idea. Why not ditch the words and show people what we’re doing and what we’ve accomplished so far. Thanks to the Flickr photo sharing Web site we can do just that through a powerful, but decidedly old-fashioned tool – the slide show. Royal Brougham Way Construction Progress tracks construction on the new structure that will span the railroad tracks from last April to this week. Going Underground looks at work that went into drilling and filling the pier shafts for the bridge and ramp. A forest of falsework is my attempt to visually explain the critical role that temporary wooden and steel supports play in bridge and ramp construction. Geofoam is a look at the unusual and dense styrofoam blocks that we’re using as fill on the project. Construction closeups shows some of the smaller details of construction that the public doesn’t usually see. Ever followed along as a boat is being built? The Chetzemoka construction has been fantastic to follow. Check out the rest of the historic construction photos on Flickr.